During his four years as a missionary in Jamaica, Jerry F. Datema developed an abiding love for the people of this country. He later served Jamaican Conference for 12 years as a bishop. He had intended to retire in Jamaica, but cancer took his life shortly after he retired. 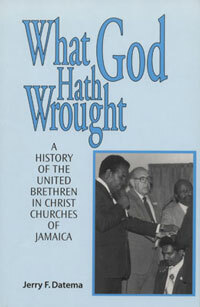 However, in the year before his death, Jerry Datema devoted himself to completing a history of the United Brethren work in Jamaica. This is that book. It begins in 1943 with the story of James O’Sullivan, who founded the work in Jamaica, and continues up to 1997, when the book was published.